On crisp Fall days, we love to grill out - especially burgers. (Hopefully those of you with new homes are also enjoying this part of home ownership as well!) But there are also days that we just don't feel like cooking, so we opt to go out. With so many amazing burger joints in Indy, how is one to choose? From Greenwood to Downtown to the North side, Indianapolis is covered with endless options to get some beefy goodness. Below we've highlighted some of our favorite places to get burgers, but the list is certainly not exhaustive. Bru Burger has earned the title of Best Burger in Indianapolis (according to the Indy A List) in 2013 and 2014, and it certainly does not disappoint. Located on Mass Ave, they have 17 burgers to choose from. From the Mexicali to the Cheese Garlic Burger, they have something everyone's taste buds will love. Not into beef? No problem! They feature gourmet chef burgers, as well as veggie, turkey, and ahi tuna varieties. Bubs is conveniently located right off the Monon Trail in downtown Carmel. It's home of the Big Ugly, a one pound burger (post-cooking weight) that when consumed gets your picture on the wall. But if you don't have a massive appetite, they have smaller options as well. Their buns are custom made to fit their burgers at a local bakery. 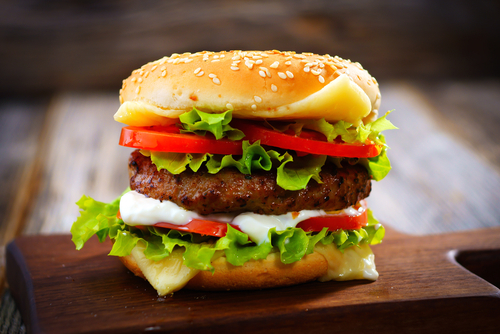 If you're watching your calories, try their Elk Burger, which is a healthier option. Oh, and we love that Bubs is a family-owned-and-operated business; "Bub" can usually be found in the back pattying burgers or visiting tables most days of the week. Between the Bun is in Greenwood and is another locally-owned-and-operated business. What's their secret? Their burgers are hand pattied daily and are made with hand made seasonings, spices, and the freshest ingredients. They boast 17 unique creations - including the PB&J Burger (peanut butter, pepper jack cheese, bacon, jalapenos, and maple syrup) and Lil Mama's Brunch Burger (cheese, egg, bacon, and maple syrup). If you're not in the mood with something a little out of the ordinary, they have plenty of "regular" options too - like their Classic Cheeseburger. Boogie Burger is in the heart of Broad Ripple. Looking for healthier options? Their menu also has chicken, ahi tuna, and veggie burgers as well. A few of their specialties are the New York New York (1/3 pound burger stacked with pistrami and swiss cheese) or the Disco Inferno (grilled serrano chilies with pepper jack cheese) for those of you who like it hot. If you visit, make sure you also have one of their award-winning shakes spun with hand-dipped ice cream. Yum! Punch Burger is another local favorite Downtown. All of their beef is raised locally in Jasper, Indiana, with no hormones or anti-biotics. Choose from Angus beef, natural turkey, or vegan veggie patty, then load it up with your choice of toppings. Or you can try one of their delicious creations. We love the Texan (onion, cheddar cheese, and BBQ sauce) and the Aloha (ham, pineapple, swiss cheese, teriyaki glaze). They're sure to add a "punch" of flavor to their burgers! Where is your favorite place to get a burger in Indy? Comment below - we want to know!